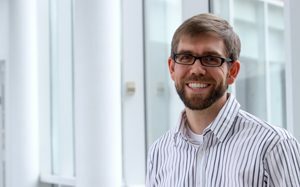 Chemistry of Life Processes Institute faculty Michael Jewett will be honored with a 2017 Charles Deering McCormick Professor of Teaching Excellence award. The award recognizes his dedication to high-quality education and passion for advancing his discipline through teaching. Jewett will receive the award at an installation ceremony at 4 p.m. Thursday, May 18, in Scott Hall’s Guild Lounge. All members of the Northwestern community are invited to the ceremony and reception. The Charles Deering McCormick Professor of Teaching Excellence award is one of the University’s highest forms of recognition of its best teachers. The award has a three-year term and includes $7,000 to the recipient as a salary supplement and a $3,000 award to the recipient’s home department to support activities that enhance undergraduate education. The process for selecting award recipients begins with nominations from the deans of the schools or colleges in which the recipients have principal appointments. The selection committee — chaired by Provost Daniel Linzer and including senior faculty members, University administrators and a student representative — then selects the awardees. Jewett is an associate professor of chemical and biological engineering and co-director of Northwestern’s Center for Synthetic Biology. His love for teaching led him to participate in the Junior Teaching Fellow Program at the Searle Center for Advancing Learning and Teaching. Jewett developed two new courses for the McCormick School of Engineering, one of which broke ground as one of the first undergraduate synthetic biology courses in the country. He also co-founded and co-led the Northwestern team in the international Genetically Engineered Machine competition. In recognition of his teaching, Jewett received the Cole-Higgins Award for Excellence in Teaching and has twice been named to the Faculty Honor Roll. Jewett’s advocacy of the sciences extends to programs he has initiated with Chicago Public School high school teachers with the Office of STEM Education Partnerships in preparing the next generation of undergraduates. Jewett received his PhD and MS from Stanford University and his BS from the University of California, Los Angeles. Original article written by Kayla Stoner and published on the McCormick School of Engineering website.